Today, Rock & Brews® announced that KISS rock legends Paul Stanley and Gene Simmons, co-founding partners in Rock & Brews family-friendly, rock-themed restaurants, plan to open a Rock & Brews restaurant in the beach-side, historic community of Pa’ia on Maui in January. The opening of Rock & Brews Pa’ia represents the rock-icons’ first in the Hawaiian Islands. An opening celebration is scheduled for Sunday, January 26, with a special KISS Rock & Roll VIP Package available at The Fairmont Kea Lani, Maui, the official resort sponsor of the event. Stanley and Simmons, along with their Rock & Brews co-founding partners restaurateur-hotelier Michael Zislis and concert and merchandising veterans Dave and Dell Furano, have teamed up with longtime Maui residents Mark and Chrystie Blietz for the opening. The Blietz’s will own and operate the Pa’ia location. Rock & Brews Pa’ia was designed by Maui architect Jim Niess of Maui Architectural Group, along with teacher, spiritual leader and artist A. C. Kahekiliui'la Lagunero of Maui, serving as a consultant on Hawaiian culture and art. The ‘ohana restaurant will pay tribute to the familial warmth and character that is synonymous with Pa’ia, while respecting the vibrant Rock & Brews brand look and feel. It will feature Rock & Brews’ popular casual American comfort food, as well as local favorites, and a full bar, including Pa’ia’s largest selection of craft beers. The grand opening of Rock & Brews Pa’ia, hosted by Simmons and Stanley, will take place from 1:30 p.m. to 3:30 p.m. on January 26 and will benefit the Pa’ia Youth & Cultural Center and pay tribute to returning veterans, Wounded Warriors and active military. The luncheon will welcome local VIPs, members of the military, KISS fans from around the world, and music industry notables. The Fairmont Kea Lani, located in nearby Wailea, will be offering a KISS Rock & Roll VIP Package, available to guests attending the opening. 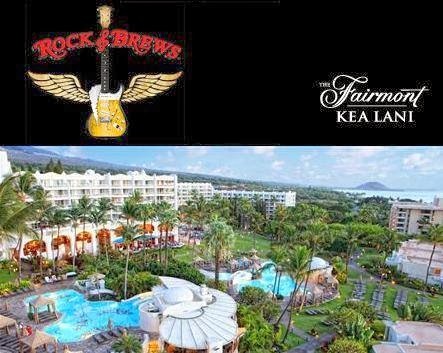 The package includes a one-bedroom suite at The Fairmont Kea Lani, two tickets to the Rock & Brews Pa’ia opening, access to the resort’s Willow Stream Spa VIP grand opening party from 6:00 p.m. to 8:00 p.m. also on January 26, (with meet and greet and photo opportunities with Simmons and Stanley,) as well as a black & white manicure station, a rock & roll red lipstick station, hot rock neck massages, rock & roll sushi rolls from the resort’s award-winning Kō restaurant, and more), and two Rock & Brews Pa’ia t-shirts. It is valid January 24-27 (three nights) and priced at $349 per night, plus tax and resort fees. For more information or to make reservations, please visit www.fairmont.com/kea/kiss-rock-roll/. Rock & Brews Pa’ia is located at 120 Hana Highway in Pa’ia. For more information, please visit www.fairmont.com/kea/kiss-rock-roll/.